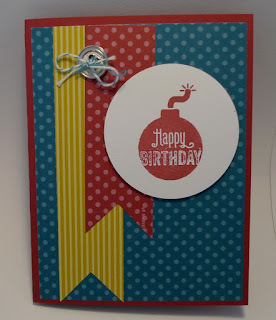 Karina's Kreations: Bombs Away Birthday Photopolymer Stamp Card! Bombs Away Birthday Photopolymer Stamp Card! Have you tried the new Photopolymer Stamps yet? I just bought Bombs Away Birthday # 133411 and had to make a cute card with it! The card stock colors are Raspberry Ripple, Island Indigo and Summer Starfruit. Retiring Punch Tip: I created the pennants with my 1-3/8" square punch #119877 which is retiring May 31st. Buy it while you can!